The Incredible Hulk slot is one of the best Marvel slots that had a revamp in 2009 following the initial success of the first release in 2006. Based on the blockbust Hulk movie, the Hulk slot features stunning graphics, sounds and game play. Play the Hulk slot online at Casino Tropez. The Hulk slot is a 5 reel, 9 pay-line video slot that is part of the random Marvel Progressive Jackpot Network, that awards a random jackpot that can be triggered at any time for someone playing a Marvel slot. Stakes range from 5p per line to £5, meaning that the max bet is £45 per spin if you play all 9 lines, making the Hulk slot appeal to slots fans with all bankroll ranges, and means novice slots players can try the game with very little risk. 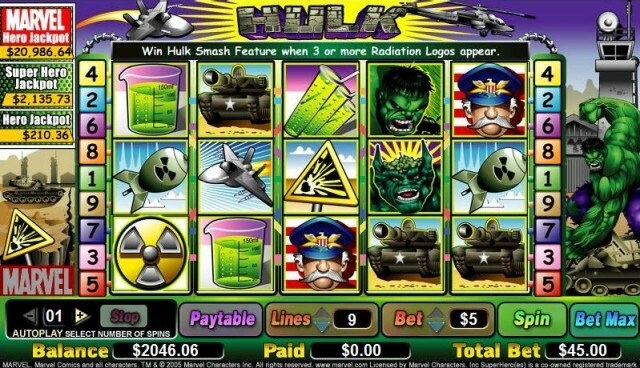 The Hulk slot features a bonus round entitled “Incredible Hulk Smash Bonus Feature”. The objective of the bonus round is to find and destroy the weapons lab, and this involves choosing to fight against either a helicopter or tank. Each time Hulk defeats one of these military vehicles, you are rewarded with a cash bonus. The cash rewards from the bonus round are very rewarding, when we played the Hulk Slot we activated the bonus round on two occasions, each time winning over £20 and we were only playing £1 stakes. The Hulk bonus round is activated when 3 or more radiation symbols appear on the reels in any order. Other symbols to look out for on the Hulk slot are Hulk logo, which acts as a scatter symbol and win multiplier. The Hulk slot is a feature rich game that will have mass appeal to both slots fans and casino players. Make sure you give it a try next time you are playing at a Cryptologic online casino. Intercasino Featuring The Hulk and all the Marvel Slots, Intercasino comes highly recommended. Casino Tropez has the latest version of The Hulk.